Sometimes the Thanksgiving leftovers are better than the main event. The Phactors dearly love orange-cranberry relish of the no-cook freshly ground sort. 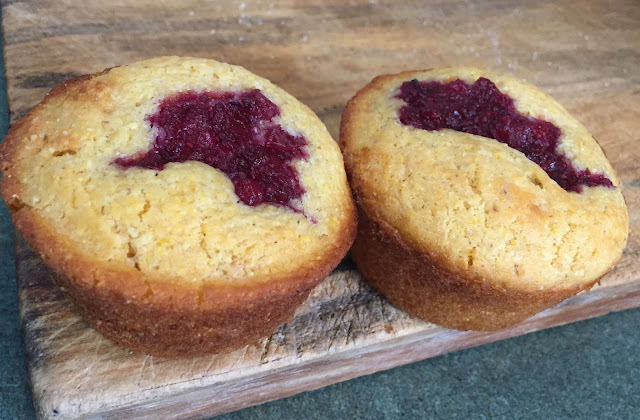 Years ago as in decades, a little corn muffin recipe in newspaper caught our eye, and it has remained a favorite item all these years. My little old Southern Grandma declared them to be the best corn muffins ever. What makes these so good is using stone ground cornmeal, which is slightly coarser than the usual store bought meal. And then a dollop of relish gets deposited on top of the dough just before putting them into the oven. They look great and taste even better. The orange-cranberry relish recipe is from years ago too, and used to appear on the Ocean Spray cranberry package--it has unfortunately now been replaced by a conventional cooked recipe. In addition to the orange, this year I threw in a small lemon. What a spritely relish that was! We've decided we'll do it that way from now on. Think I'll try it on the corn muffins, too. Towhee is correct the orange-cranberry relish is an oldie but goodie too. And love the idea of using a lemon.